The first item on the gray navigation bar is Alerts. Anything important affecting your companies appears here. If you have an alert, there will be a gold number beside the word “Alerts.” You can see the above client account has 8 alerts. Here you can find if we are about to resign on any of your entities due to non-payment of an invoice, or if there are any outstanding invoices you should pay, or what entities have tax deadlines approaching. On the Orders page, you can place a new order, view orders for invoices that are in-process with Incserv (please note the amounts shown on these invoices can change – it’s best to contact the CSR assigned to that order if you have any questions about the order), and view invoices. On the Account page, you can make changes to the client information we have on file. You can also reset your password here. On the Entities page, you can view a list of all of your entities, plus much more! We’re going to address using the Entities page in our next blog in our Snapshot™ series! On the Billing page, you can view your statement, view your payment history, and view your billing summary, including PDFs of your invoices. You can also pay your outstanding invoices from this page. We’ll talk about the Billing page more in depth in an upcoming blog. On the Franchise Tax & Annual Reports page, you can file your DE annual report if you have a DE corporation, or pay your DE LLC tax if you have a DE LLC. 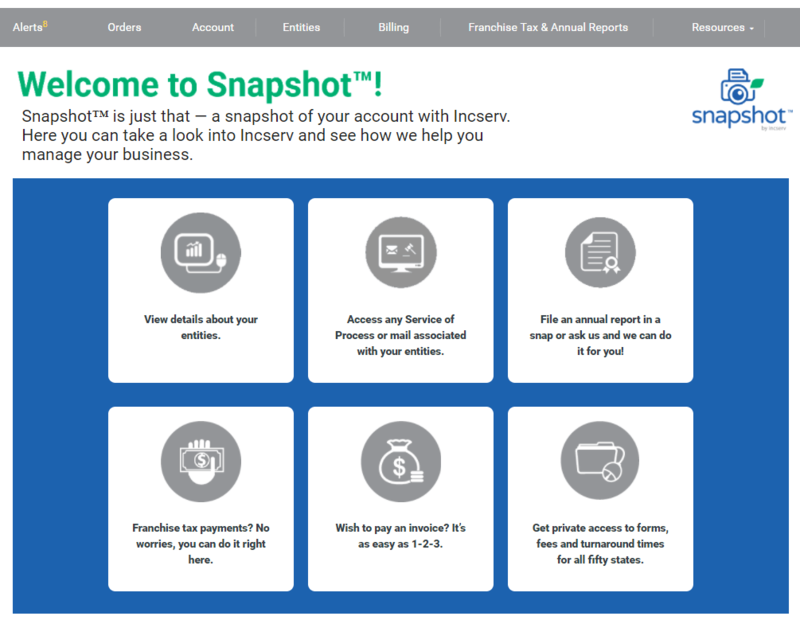 You can read more about the benefits of filing through Snapshot™ in our 5-part blog series that starts here. We’ll also touch on annual report filing and our auto-file service in the third blog in our Snapshot™ series. Finally, on the Resources page, you can view information about filing in or maintaining a company in each of the 50 states! We’ll introduce you to more information about our Resources tab in a future blog within this series. As always, if you have any questions, feel free to contact us, call us, or chat with us, and we’ll be happy to walk you through any part of Snapshot™ – or just wait for one of our upcoming blogs where we take a closer look at the benefits of using Snapshot™!